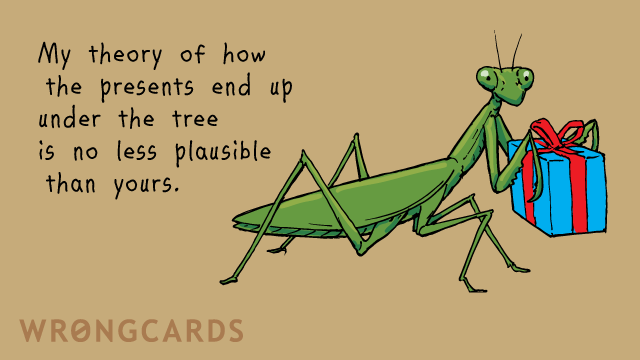 Have you talked to your children about the Christmas Mantis yet? I have. There's a note here from the school, they want me to come in and talk about it. What's so strange about an eight-foot-long Praying Mantis, climbing through windows, distributing consumer goods? Because an 'overweight Norwegian with a flying sled' is more logical? I don't know. It's better than my Christmas Leopard theory. I don't even know what this card means. I just like writing random words sometimes. Doesn't mean anything. I am figuratively seeing nothing here. 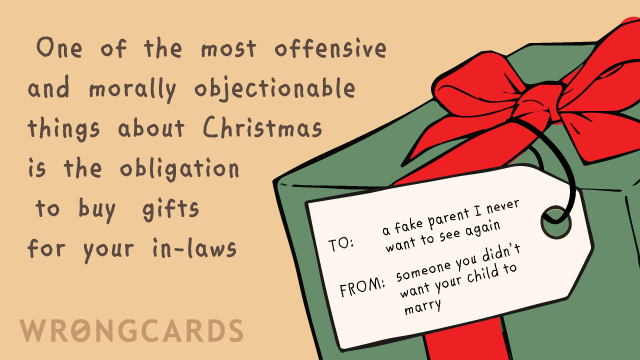 Let's not ... no, don't make this about your parents. Nobody even mentioned your parents. Why do you have to bring them into this? I am just making an innocent wrongcard, and - what? Oh. My. God. You are being SO much like your mother right now!